Golden mean. 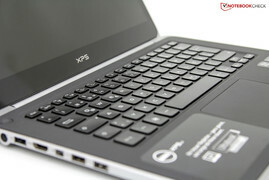 The new XPS 14 Ultrabook was presented to the press during the Dell Technology Camp 2012. After the official start at the end of June, the first units with Intel Ivy Bridge and Nvidia GeForce GT 630M are now being delivered. 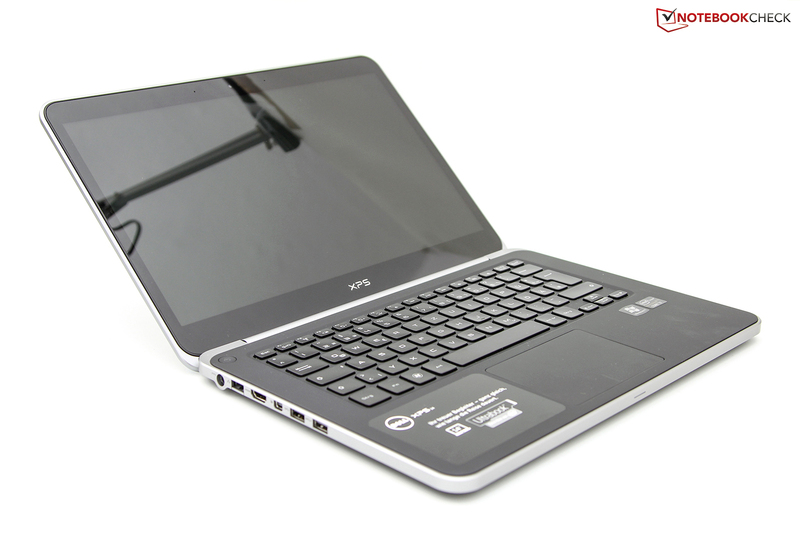 An ultrabook of the upper class that is available from 1149 Euro (RRP, ~1410 USD). The ultrabook class of notebooks is growing. After the first generation of ultrabooks, which consisted only of ones with 11.6 and 13.6-inch displays, now Dell, among others, also offers a 14-inch multimedia device. 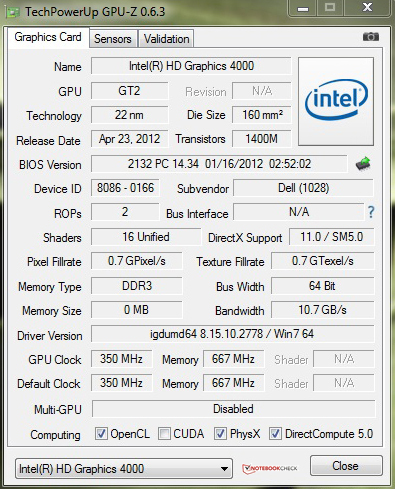 The XPS 14 passes the requirements from Intel and can thus be officially called Ultrabook. The slim height of 20.8 mm (0.82 inches) and a modern Intel Core i7-3517U Ivy Bridge dual-core processor running at 1.9 GHz are two of the major components. At the same time Dell has also fitted the smaller XPS 13 Ultrabook with new hardware, while the higher native resolution of 1600x900 Pixels of the bigger 14-inch brother is a bonus point against the smaller model. A further difference is the dedicated middle class graphics card Nvidia GeForce GT 630M, which kicks in when needed. Thanks to the automated graphics switching Optimus technology, according to Dell a battery runtime of 11 hours should be possible. 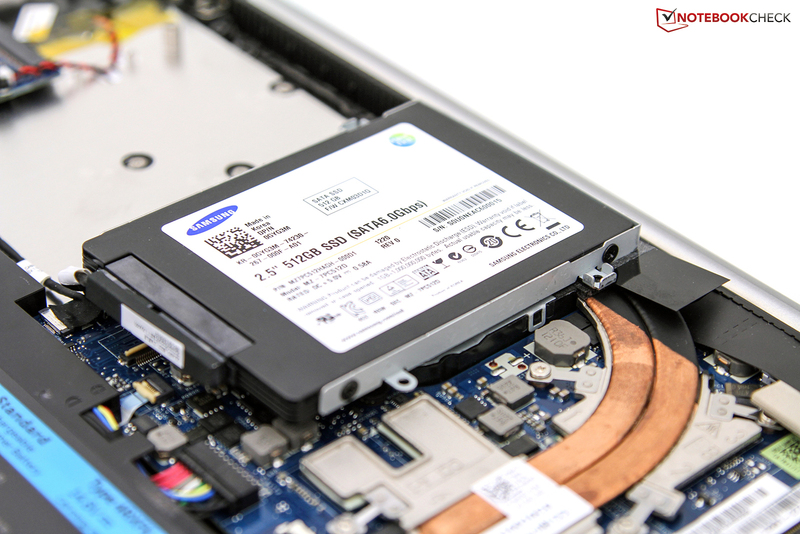 Other components of our test unit are 8 GB DDR3 system memory and a 512 GB solid state drive (SSD) made by Samsung. This whole package does not come cheap, costing 1799 Euro (~$2210). The entry-level model of the XPS 14 is however available direct from the company, with prices starting at 1179 Euro (~$1450). Workmanship and design are convincing. Visually the new XPS 14 is based on the smaller model. The difference comes from the bigger chassis 33.6 x 23.3 x 2.08cm, (13.2 x 9.17 x 0.82 inches, WxDxH) and an overall weight of 2.06 kg (4.54 pounds). 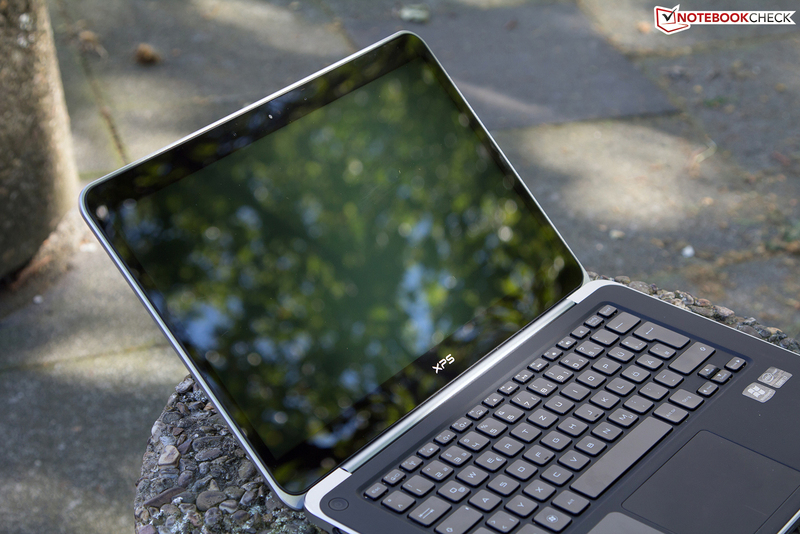 The smaller XPS 13 weighs only 1.36 kg (3 pounds) and is thus 34% lighter. The case itself is made of a single piece of aluminum, making it very stable. The palm rest is made of an aluminum-magnesium alloy. Thereby the soft-touch surface has a pleasant feel. 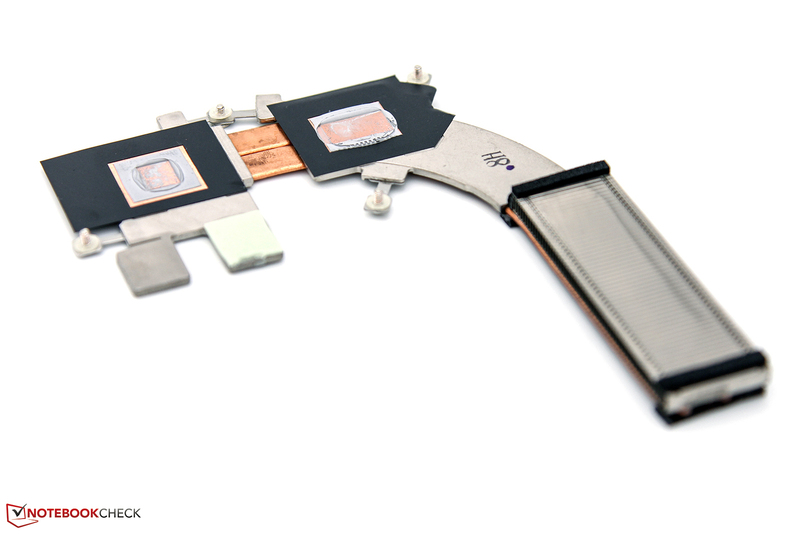 The base of the device is coated with silicon, on which the device rests. 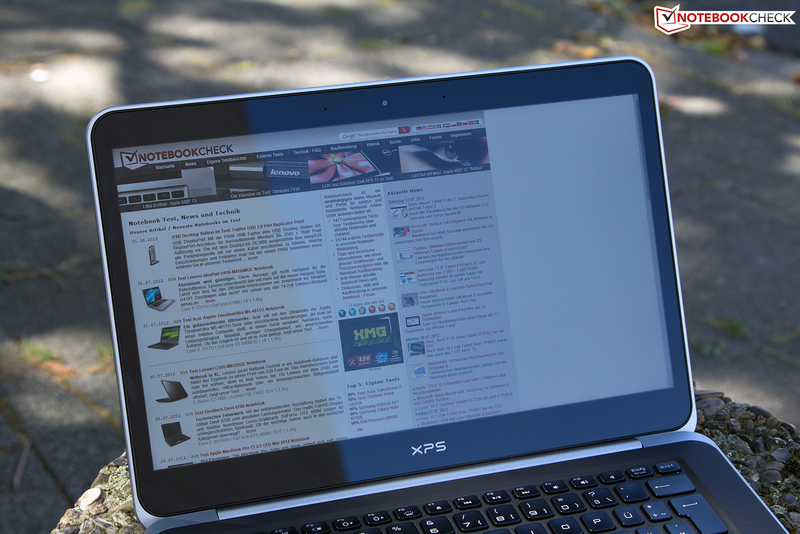 Overall the XPS 14 leaves a high-quality impression. The design is simple with a contrast of black and silver and is downright to the liking of the editor. The base unit does not give in when pressed. Even when twisted with both hands, the case stays rigid. The display lid is also made of aluminum and is further enhanced by a Corning Gorilla Glass. Overall the lid can only be slightly twisted, whereby no noises are made. The display is held by a large hinge, mounted in the center. The maximum opening angle is thus only 135 degrees. The hinge is good though a slight bobbing can be found. The continuous vibrations when used in a car might cause the opening angle to change, but this should cause no trouble when used on a train. 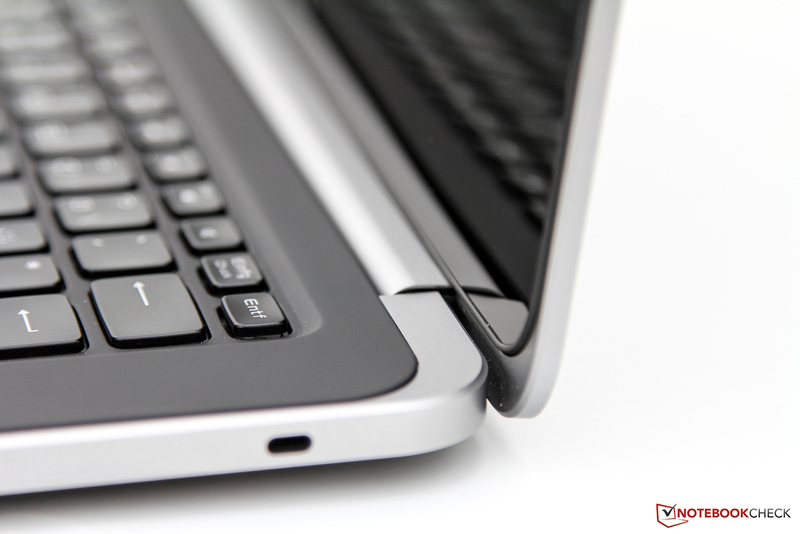 Case wise, compared to the smaller model, the ultrabook can be described like this: more space, more interfaces. Besides the two USB 3.0 ports (1x with Power Share) and a mini DisplayPort, the XPS 14 also offers a RJ-45 network port and an HDMI port. All these connection ports and the AC jack are placed at the back of the left side of the device. On the other side one can only find a 3.5mm stereo jack (Combo port) for headphones or a supported headset, a Kensington Lock and a SD card reader. The latter is hard to spot due to a color blending plastic cover. Overall we are not pleased with the transition to the case and the hassle of removing the cover, which can happen only with the help of fingernails. The location of the ports cannot be faulted as a mouse can be used on the right side of the device without problems. 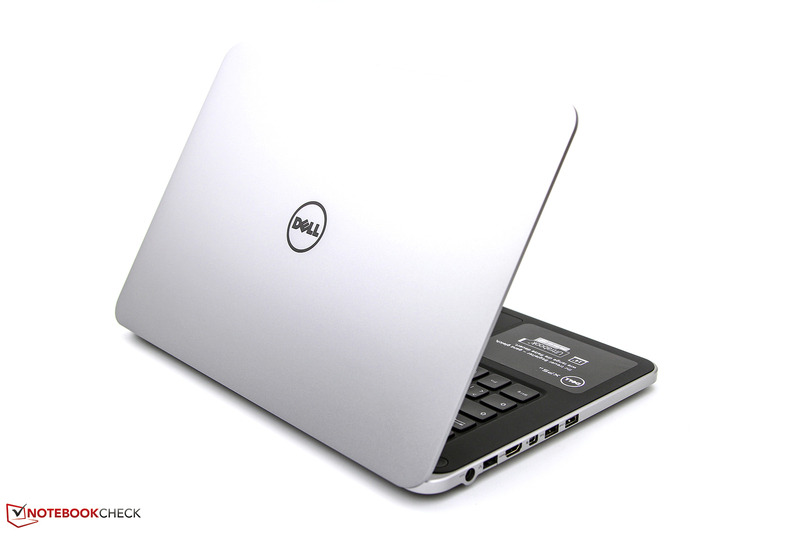 The range exceeds that of most ultrabooks, although Dell has omitted for example a Thunderbolt port, a third USB port on the right side or a separate microphone input. In terms of communication options nothing more can be desired. Besides the Intel Centrino Advanced-N 6235 radio module, which supports the WLAN standards 802.11a/b/g/n and Bluetooth 4.0, the notebook offers a full- fledged RJ-45 network port. Behind it is a gigabit control by Realtek. 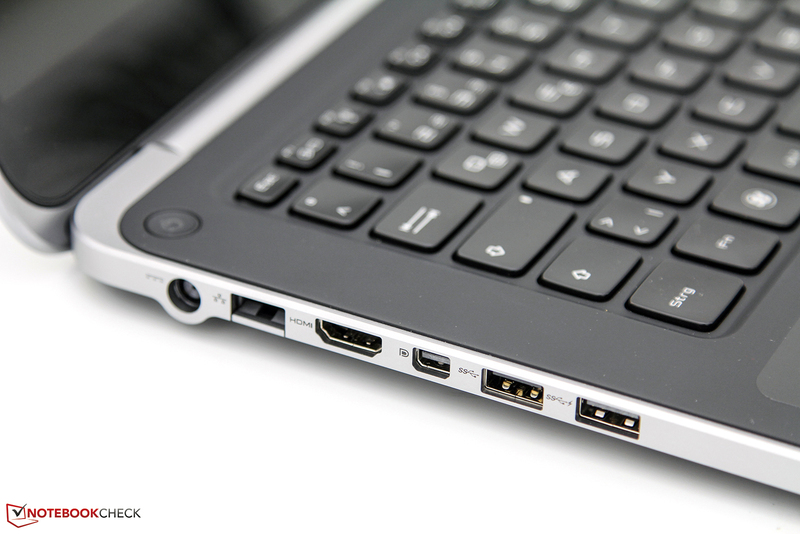 Most of the (smaller) available ultrabooks either completely omit this port, or support it only through an adapter. The Asus UX31A is an example. On the other hand Toshiba's own ultrabooks feature this port since the first generation, which through thoughtful placement at the back does not hurt the overall look. 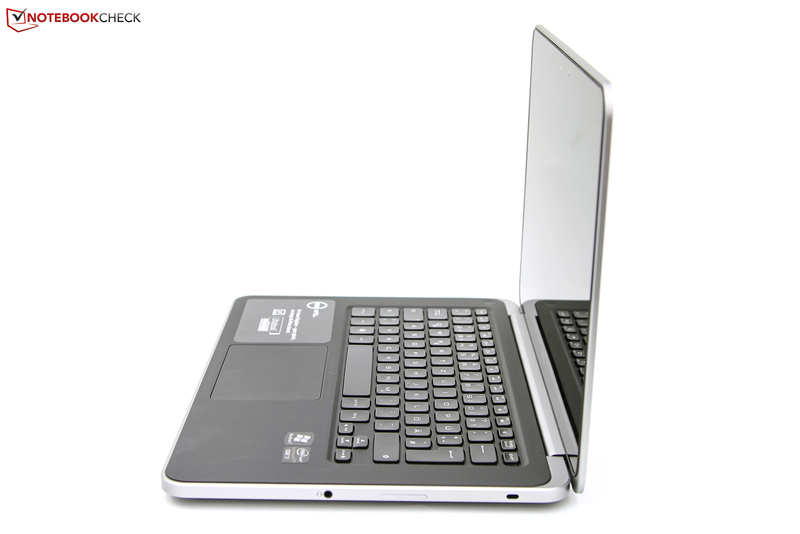 The current model of this portfolio is called the Toshiba Satellite Z930. Dell does not offer an integrated UMTS or LTE module for the XPS 14. Thus the instrument of choice is an external USB stick, which is currently available at a low price. A neat feature of the Intel card is the support of Wireless Display (Wi-Di): Through a separate receiver you can stream content wireless to the TV. Other communication options include an integrated 1.3 Megapixel webcam and two digital array microphones. This combination serves for video chats with average picture and audio quality. In the chic packaging of the XPS 14 one can only find the most necessary accessories for immediate use. Besides the device itself, included are the 65W power supply with cables and some documentation. In comparison the pre-installed software package is extensive. Besides the useful freeware Adobe Reader X and Skype, there are the usual antivirus demo version and Microsoft Office Starter. Through numerous notifications, the security program of McAfee qualifies for a quick uninstall. In addition to the programs, accessories for the ultrabook must be bought separately. During configuration Dell already offers a variety of products, whereby a price comparison is recommended. The whole underside acts as a big maintenance cover, which is held by two screws under the silver XPS plate and six Torx T5 screws. The latter are probably the biggest hurdle for most users. After removing that cover one has free access to the components. In our case these include 8 GB DDR3 on a single module and a 512 GB 2.5 inch SSD. This does not leave much room for improvement. 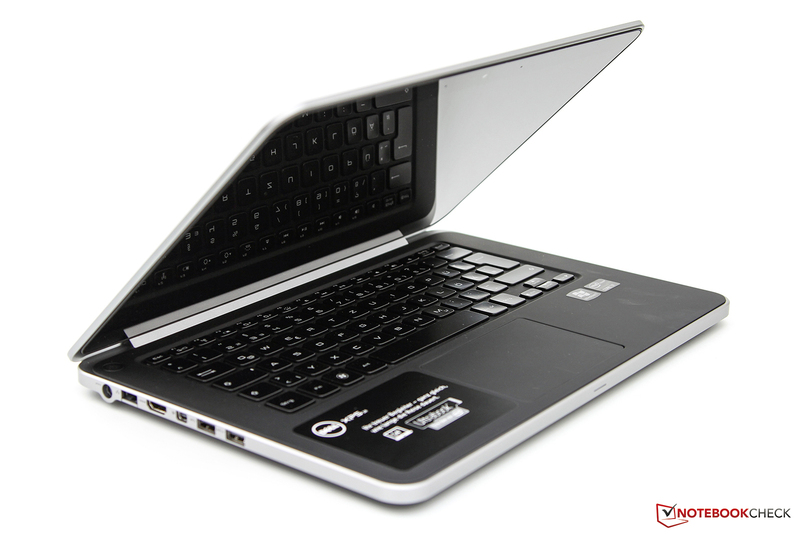 The easy expandability pays off in the entry-level configurations with a standard HDD and 4 GB of RAM. 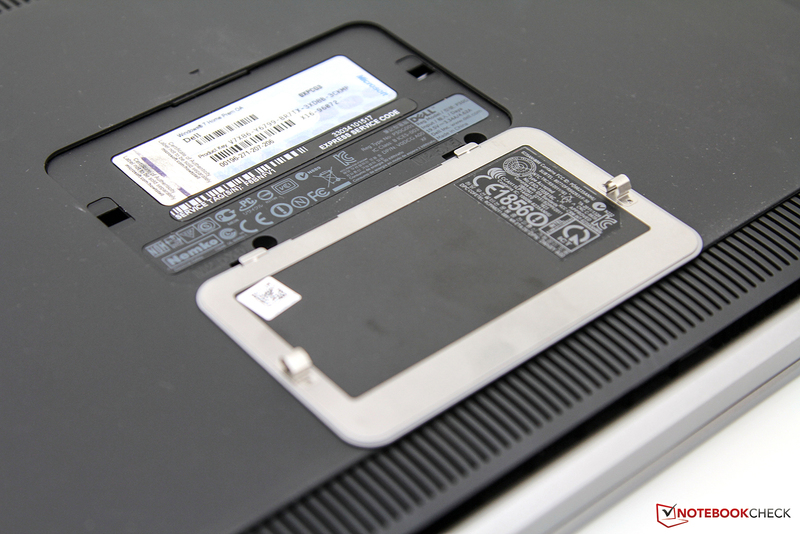 Note, however that the new HDD or respectively SSD must have a height of no more than 7 mm. Any higher components cannot fit the chassis. 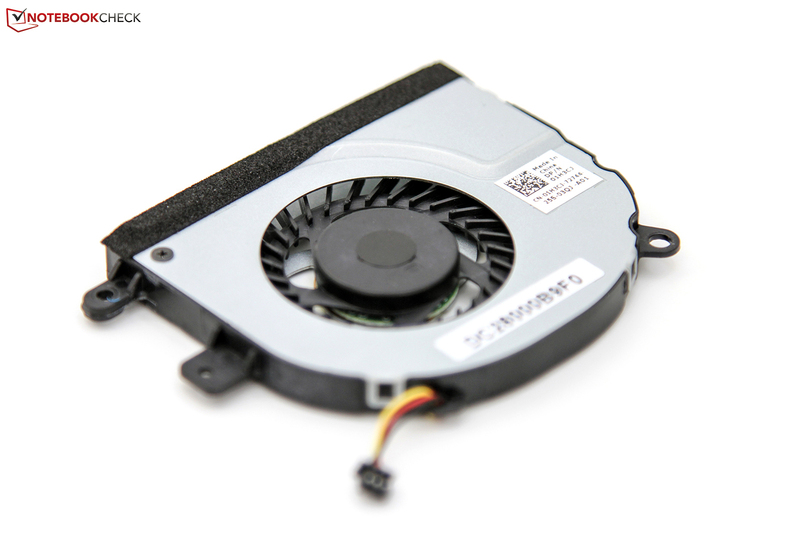 Another advantage is the possibility to clean the fan and the heat sink. 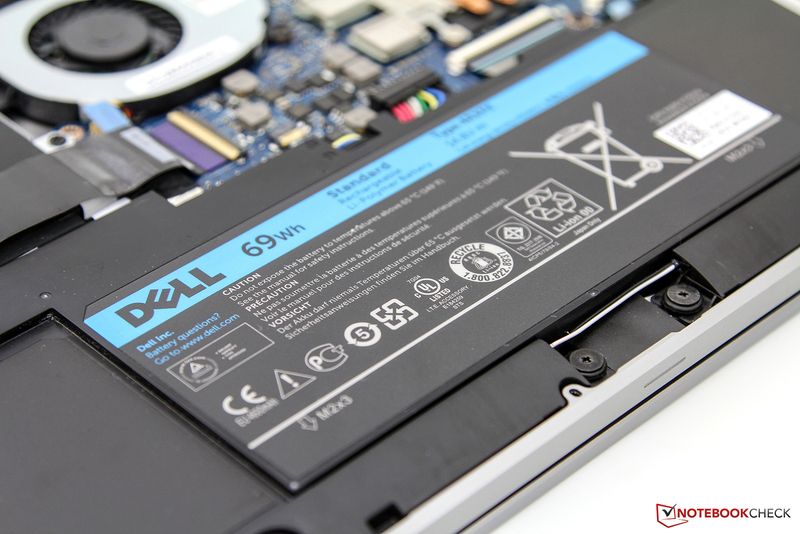 From the factory Dell provides a warranty of only 12 months. However this comes with Next Business Day On-Site hardware service and premium over-the-phone software support. 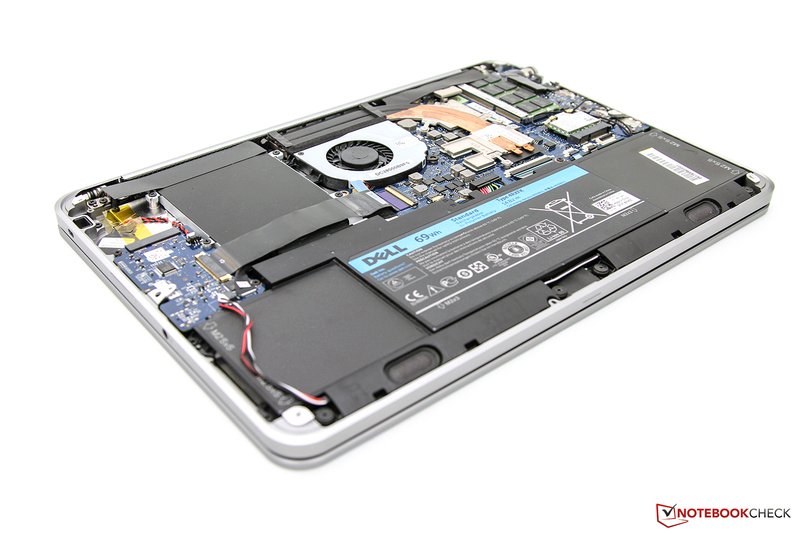 Other ultrabook manufacturers offer a 24 month warranty at no extra cost. Regardless of the configuration, Dell offers a 24 or 36 month warranty extension for 140 and respectively 188 Euro (~$172 and $231). The longer one is currently on offer through the online configurator. Normally it is priced at 280 Euro (~$344, RRP, 33 % discount). 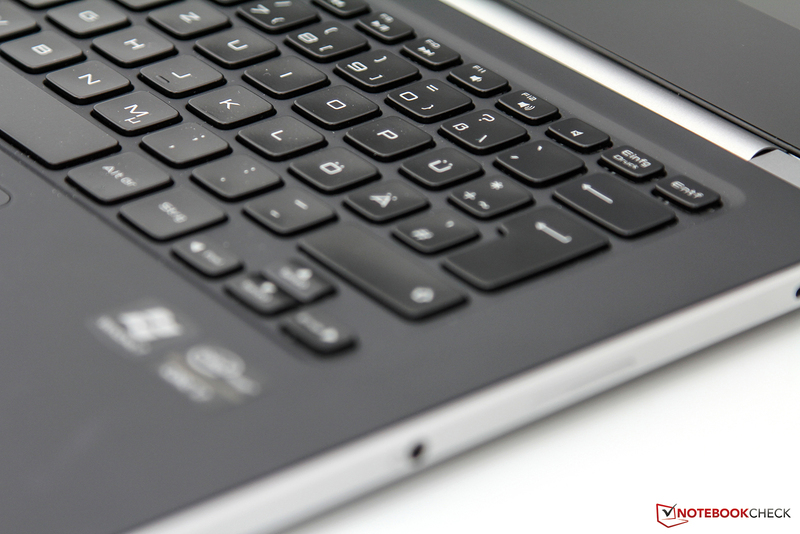 The XPS 14 shares the input devices with the bigger XPS 15, which we recently reviewed. Thus there are no differences in the touchpad and the keyboard. Only the edges of the keyboard feel slimmer due to the smaller case. 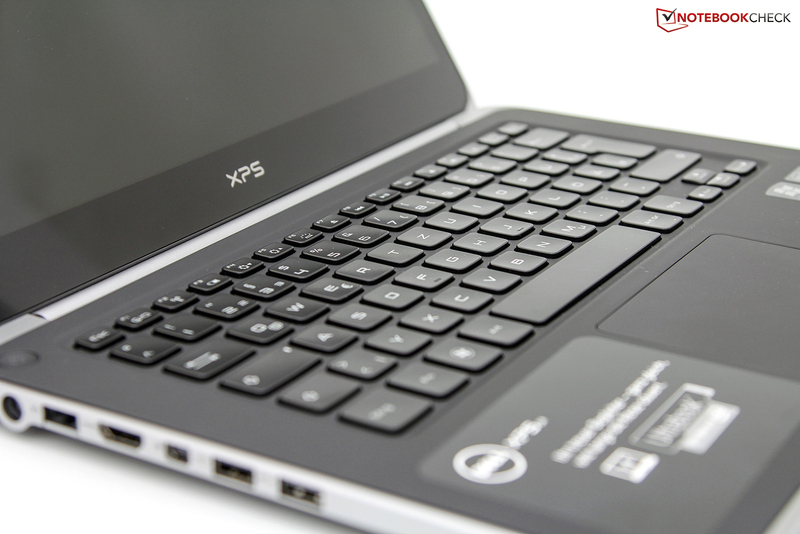 You can find detailed information in the review of the bigger series representative, Dell XPS 15 (L521X). 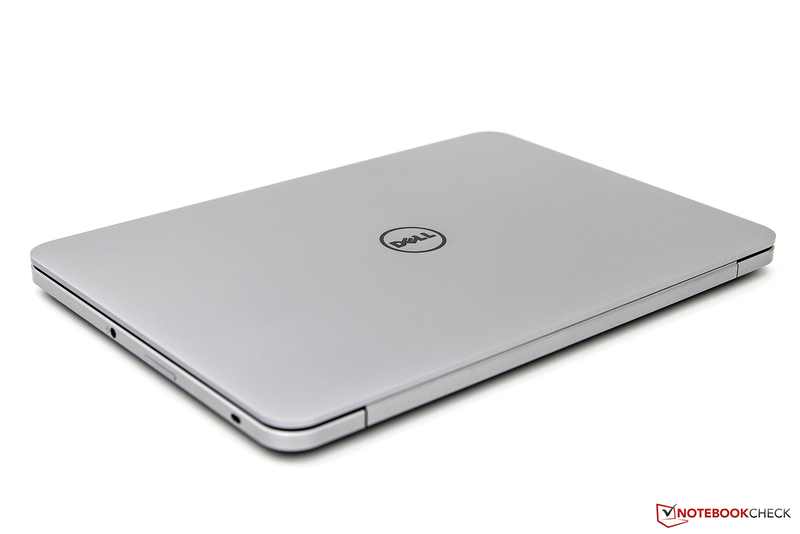 The XPS 14 is the first Dell ultrabook to feature a 14-inch display. It has a resolution of 1600x900 pixels. 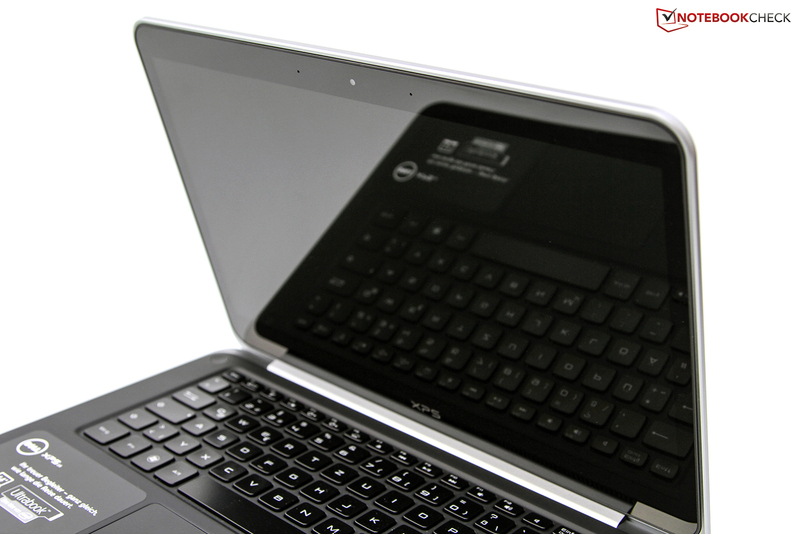 The screen surface is, like the other XPS devices, glossy. In this case we are talking about a resistant and durable Corning Gorilla Glass. The resolution (HD+) is most noticeable when compared to cheaper entry-level devices. These offer at most 1366x768 and are thus uncomfortable for working with numerous open windows without an external display. On the other hand Asus has in its portfolio (UX21A, UX31A & UX32VD) ultrabooks with native Full HD resolution. Dell offers no further configuration in this area. The panel of type AUO103E must now undergo a series of extensive measurements. 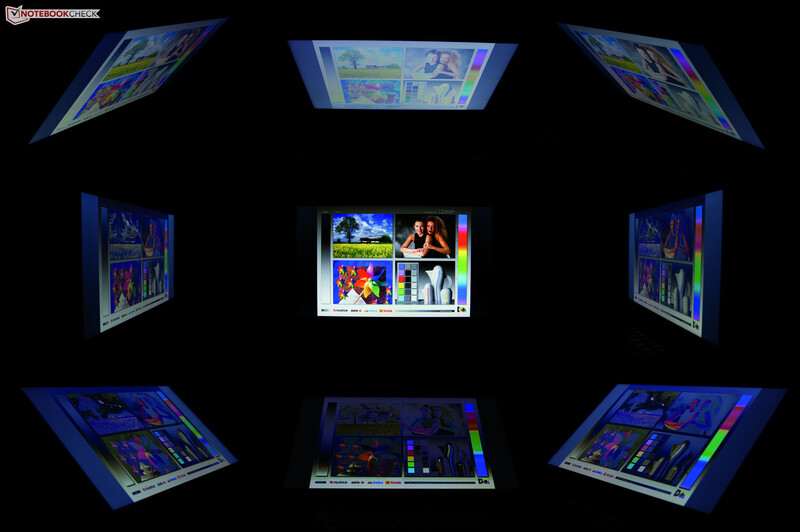 The display shines with a high maximum brightness of 416 cd/m². This can be measured at the center of the display, whereas the other regions fall behind. The minimum is only 338 cd/m². Due to this difference the average brightness distribution is only 81%. The black level of over 2 cd/m2 is considerably too high. As a result the black is grayish and the contrast ratio is low. The lack of contrast clouds the joy of watching movies and photos. Subjectively nothing can be desired of the color temperature and image sharpness. In outdoor use the glossy Gorilla Glass is the biggest obstacle. Reflection can never be avoided, even in a shady spot. Thanks to the high brightness of the display, one can still work even with lowered brightness. Readability in direct sunlight is limited. A matte foil might help in this case, although this would diminish the image sharpness. The ideal would be an XPS 14 with (optional) matte display. In conclusion the viewing angle stability confirms the mixed impression of the TN panel. In horizontal change the picture stays mostly stable, although a drop in brightness is visible. The vertical is relatively unstable. Even a slight deviation from the optimal position leads to inverting and fading of the reference image. 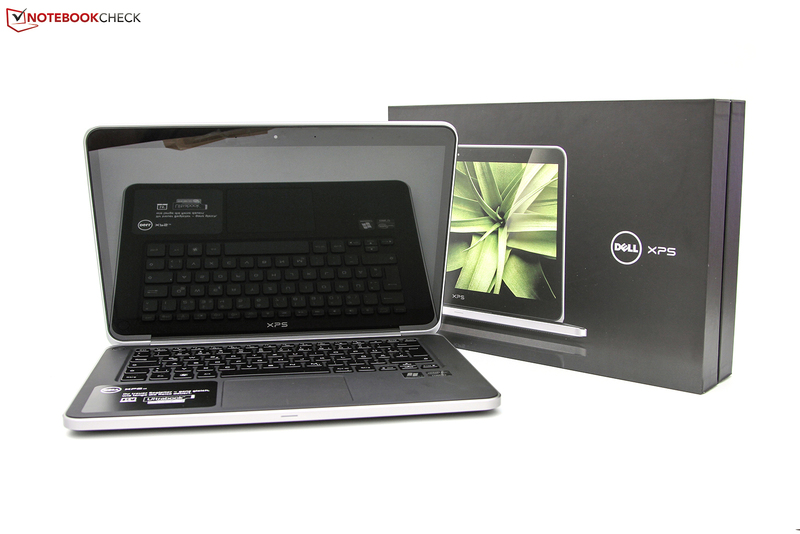 The Dell XPS 14 is the first test unit in the office with the new Intel Core i7-3517U dual-core processor. This ultra low voltage processor works at a clock frequency of 1.9 GHz, has two cores and four threads - it is the cutting edge in Intel's mobile dual-core processors. Through the integrated Turbo Boost 2.0 the clock frequency can reach 3.0 GHz when one core is stressed. 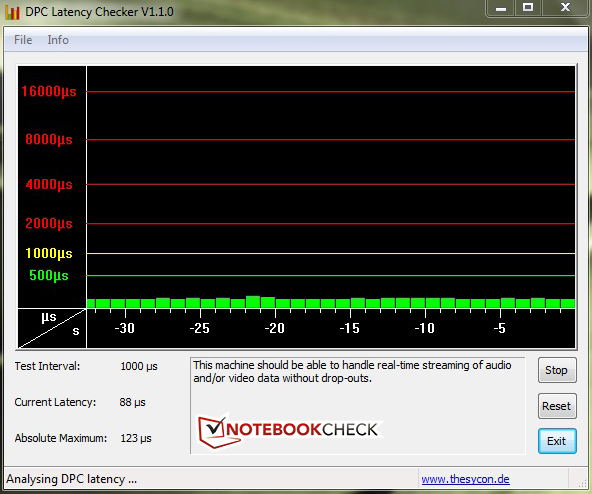 With two cores active, this frequency is the still very high 2.8 GHz. In comparison to the older generation, the Ivy Bridge processors are manufactured using the 22 nanometer process with 3D transistors. 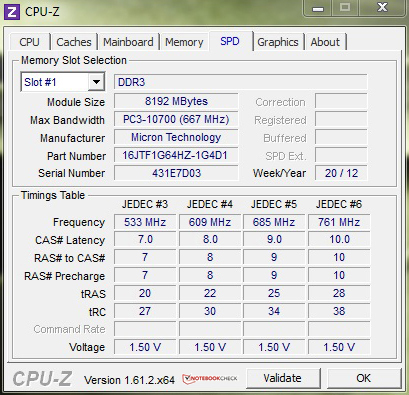 The last year equivalent is called Intel Core i7-2677M, but it does not feature the nimbler 1600 MHz DDR3 system memory. Further specifications include the integrated Intel GMA HD 4000 and in this case also the dedicated Nvidia GeForce GT 630M. This GPU currently ranks at the bottom of the middle class and offers 1024 MB GDDR5 memory, which is accessed through a 64-bit bus. Apart from the increase in performance compared to the CPU graphics card, this also supports the Nvidia Optimus technology. Thus, according to the application and demand, the appropriate card is activated and so the balance between performance and efficiency is mastered. Configurations differ in the type of the drive and in the capacity. 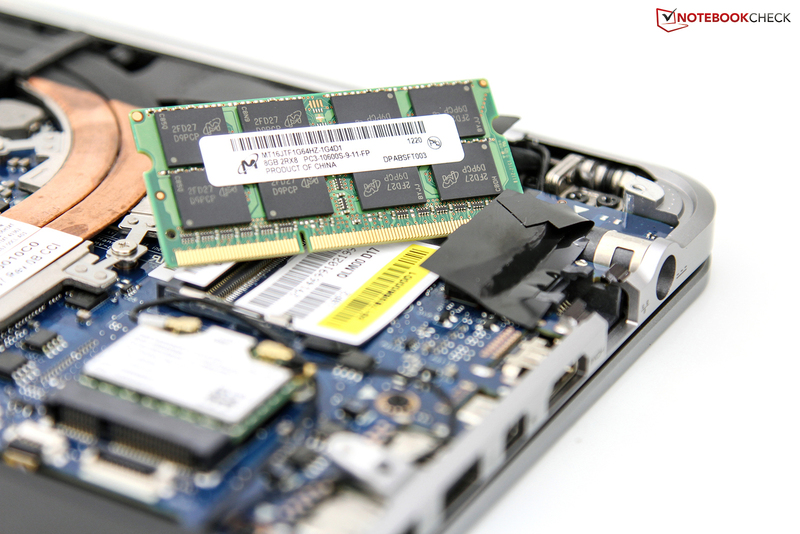 Our test unit enters the race with a 512 GB large SSD and 8 GB DDR3 of system memory. 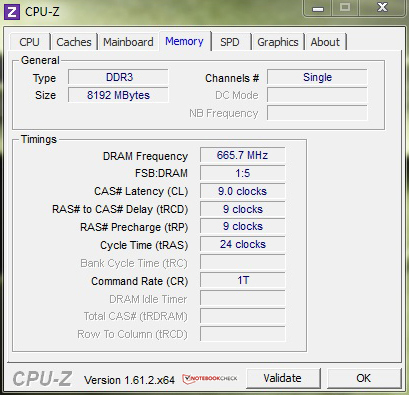 The latter interestingly works at 1333 MHz, although the new platform already supports higher frequency memory. Starting our testing are the numerous CPU benchmarks, of which we use Maxon's software for comparison. In the current multi-core test of CineBench R11.5 the Intel Core i7-3517U scores 2.78 points. The Intel Core i7-2677M in the Asus Zenbook UX21E scores only 2.13 points, falling 23% behind. 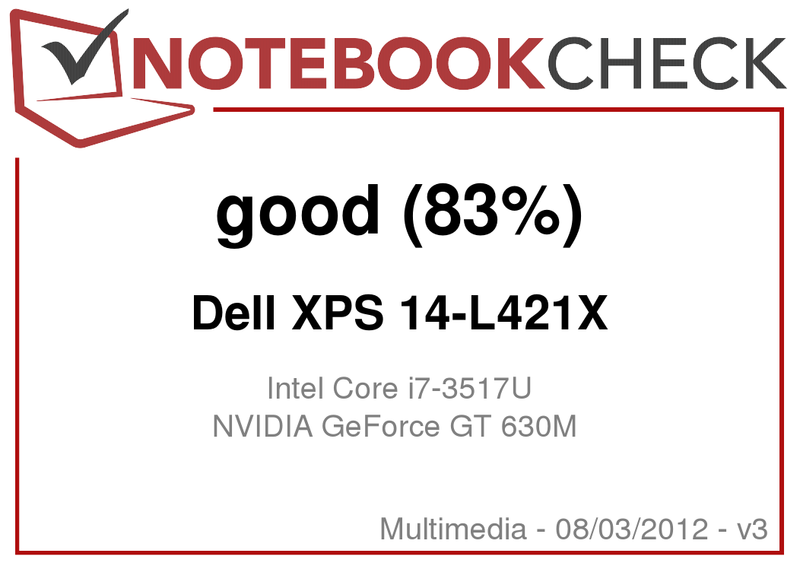 The Dell XPS 13 is on a comparable level with a score of 2.25 points (19% difference). It is also worth having a look at the Intel Core i5-3317U Ivy Bridge dual-core processor, which is found in many current ultrabooks. 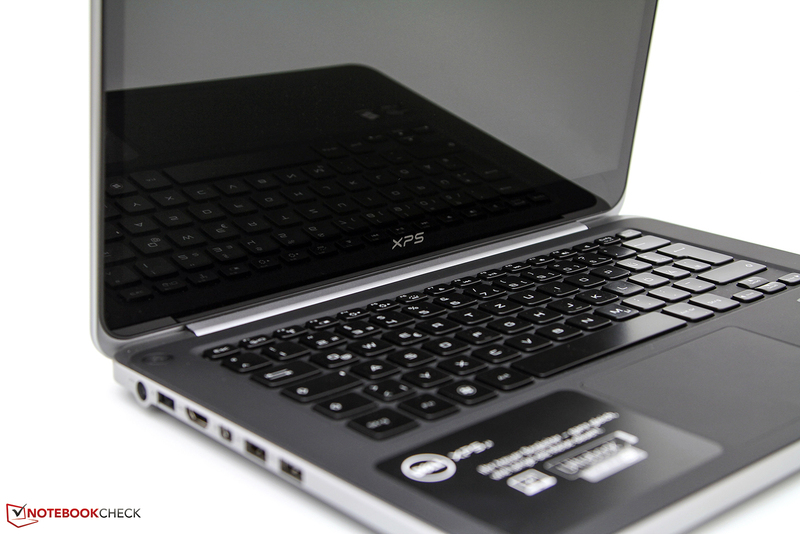 The entry level model of the XPS 14 is also supplied with the unit in question. On average it scored 2.2 points in the multi-core test of CineBench, a difference of about 21%. For the normal user the high performance will probably not pay off, since the increase costs 120 Euro (~$147). The top configurations on offer are delivered with the more powerful processor. 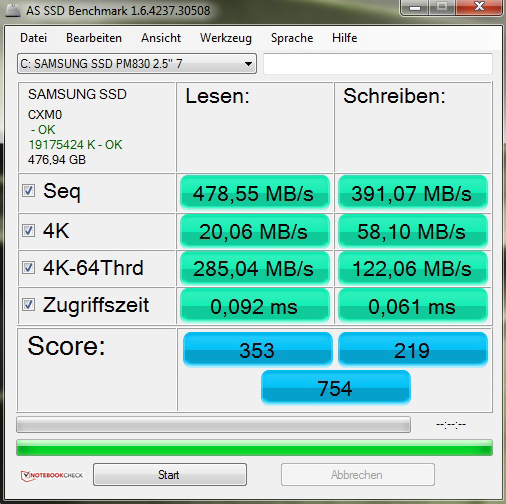 The system performance can be seen: In PCMark 7 by Futuremark the test configuration scored 3467 points overall, positioning the ultrabook in the top third of our database. 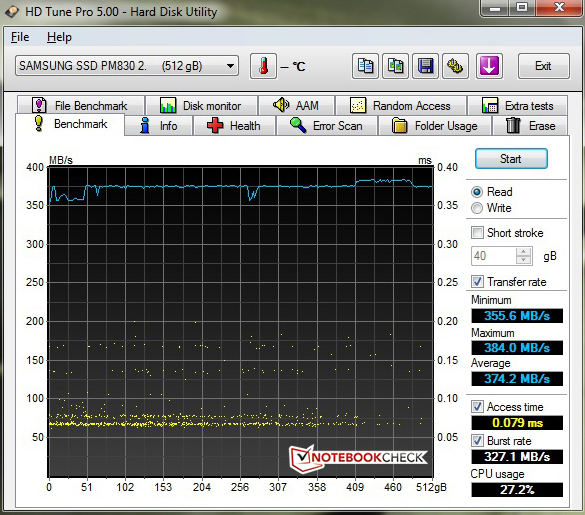 On comparable level are many ultrabooks with a fast SSD, which affects the test considerably. The neighbors include the Lenovo IdeaPad U310, the Samsung Series 9 900X4C-A04DE and the above mentioned Zenbook ultrabooks by Asus from last year. The Dell XPS 13 is 10% faster with a score of 3823 points, but subjectively this is not noticeable. The loading times are minimal and the XPS 14 works overall very smoothly. The cheaper models of the XPS 14 with a standard HDD should be somewhat slower in terms of loading times. 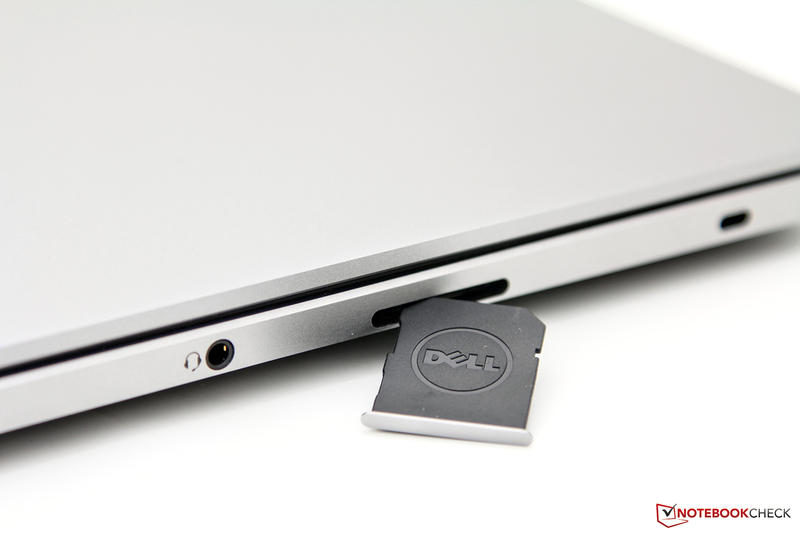 Depending on the model and price the XPS 14 is delivered with either a normal HDD or a 512 GB solid state drive (SSD). More precisely this is a unit from the Samsung 830 series with SATA III interface with up to 6 Gbit/s and height of 7 mm. Higher units do not fit in the slim device. With transfer rates of over 400 MB per second in sequential operations (CrystalDiskMark) and very low access times (AS SSD) this model leaves a very good impression. The flash storage is available from the factory in the top model for 1799 Euro (~$2211). Given the current low prices of SSDs a post installation pays off, whereby one must be careful of the height. 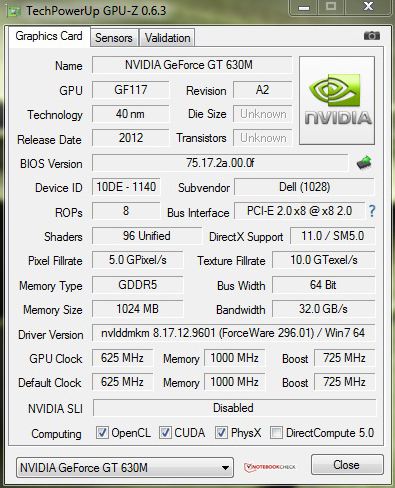 The next step is to put the Nvidia GeForce GT 630M through the synthetic gaming benchmarks. In the proven 3DMark 06 the test unit scores 6881 points and thus is at the middle of our extensive database. 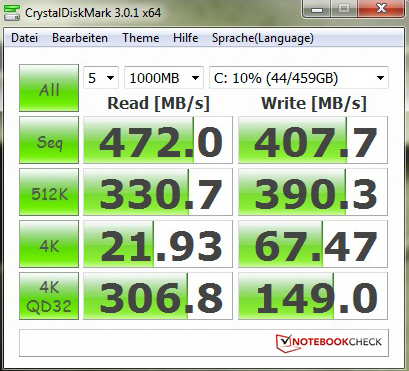 The Dell XPS 13 with the older Intel GMA HD 3000 is in comparison 54% slower (3196 points). 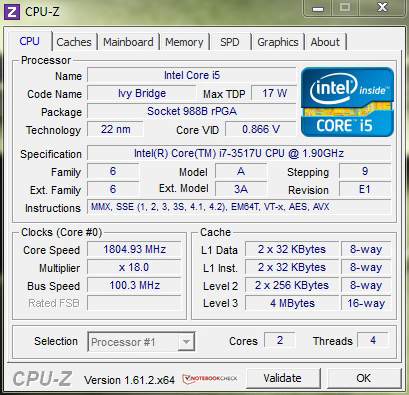 The current Apple MacBook Air 13 Mid 2012 with the newer Intel GMA HD 4000, which is the second card of the XPS 14, reaches a score of 5819 points in Windows 7 (15% difference). In view of the average value of the two graphics chips in the XPS 14 there is a 36% difference in favor of the Nvidia GPU. The newer 3DMark 11 confirms the results of the earlier version with small differences in the percentages. The pure gaming performance can be considered lower middle class. Less demanding games like TrackMania Nations Forever or the beloved Diablo III can be played even at higher settings without stutter. When playing demanding games however the Nvidia GeForce GT 630M quickly reaches its limits. Overall the GPU offers no guarantee for stellar gaming performance. For casual gamers who play from time to time and do not have high requirement of resolution and details the offer from Dell is practical. Thanks to the flash storage and the lack of optic drive, the only noise source left in this configuration is the fan. 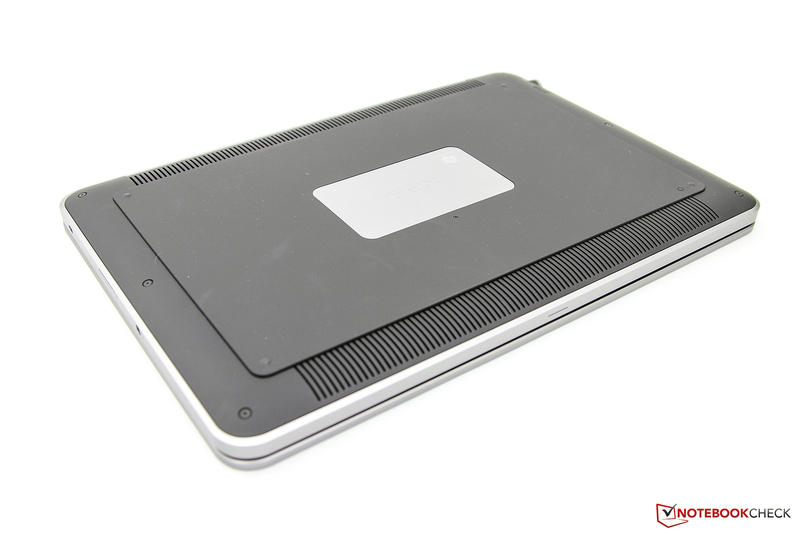 During office use the ultrabook operates silently throughout, with the noise level measured at 29.6 dB(A), which is the lowest our instrument shows without side noises. Above all this silent operation is useful in the library or at the office, where one is not disturbed by the sounds of the device. Under load the dedicated Nvidia GeForce GT 630M is automatically turned on and the fan starts spinning. At a distance of 15cm (5.9 inches) we measured a level of 45.7 dB(A). Thus the device is audible, but it sounds at a constant, not too high frequency, which is not annoying in the background. When comparing the Dell XPS 13 and the Dell XPS 15 we only find minor differences. A final advantage is the rapid drop in the noise level when the load decreases. A piece of the cooling system. 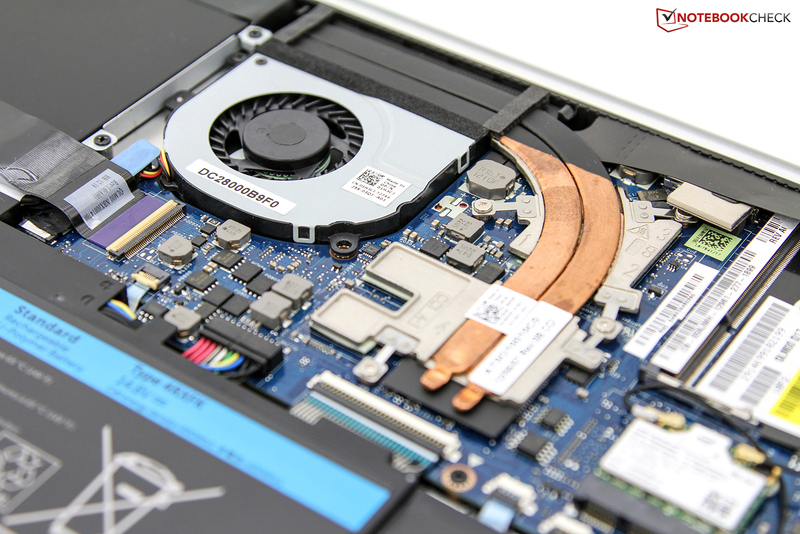 In addition to the fan, an L-shaped heat sink completes the cooling system of the XPS 14. Temperature is above all a critical point in slim devices, which would be carefully considered in this case due to the dedicated graphics card. 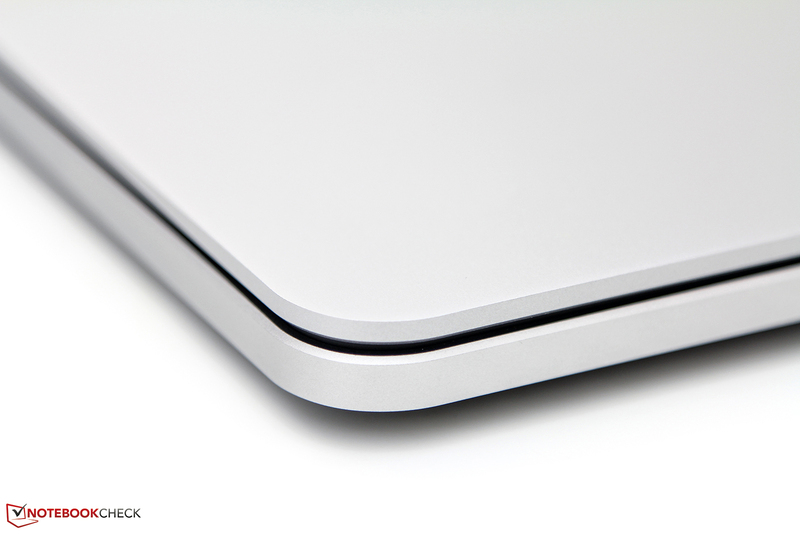 At idle the case is lukewarm, and the special soft touch surface dissipates the extra heat pleasantly. A maximum of 33.5oC was measured at the keyboard. The bottom side stays cool with an average of 31.3oC. Thus in this case, working on the lap poses no problem. 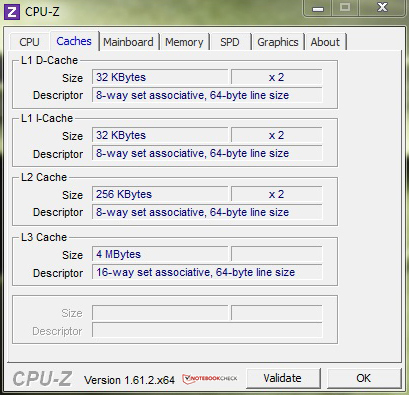 With the tools Prime95 and Furmark we can extract the maximum from the hardware. After a one-hour run time of the stress test, the device was significantly warm. At the peak over 50oC was measured at the keyboard. In this case one does not want to touch the device any more. The palm rest stays clearly cooler with a difference of 20oC, but the bottom side cannot be ignored any more as it is also very warm. When browsing through the Wi-Fi, the temperatures on the lap are not unpleasant. Only during prolonged phases of load (gaming, rendering, etc.) should significantly higher surface temperature be expected. In this case the device should remain on the desk, because of the better air circulation. (-) The average temperature for the upper side under maximal load is 44.2 °C / 112 F, compared to the average of 30.9 °C / 88 F for the devices in the class Multimedia. (+) In idle usage, the average temperature for the upper side is 31.1 °C / 88 F, compared to the device average of 30.9 °C / 88 F.
An important point for today's notebooks is the battery runtime, which depends on the power consumption of the chosen components. The reviewed Intel Core i7-3517U is an energy-saving ultra-low voltage dual-core processor of the current Intel Ivy Bridge family. This processor consumes 17 W according to specifications, with the dedicated Nvidia chip adding more consumption. 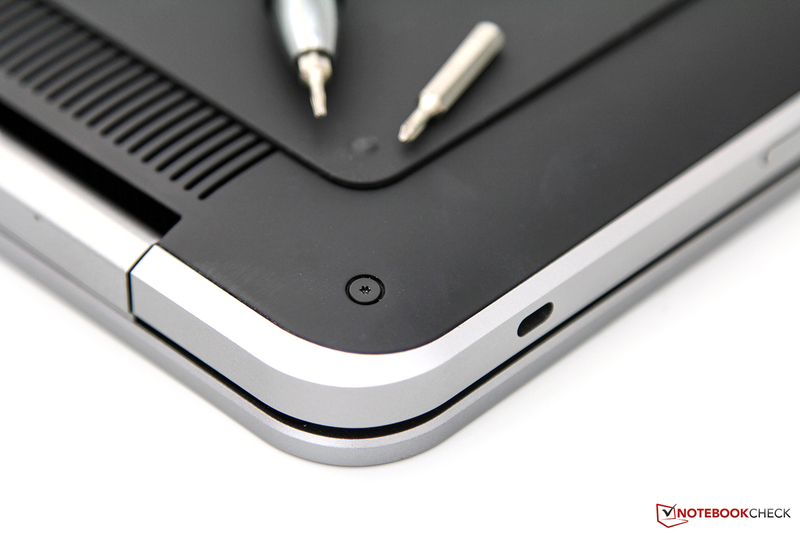 Most of the ultrabooks work only with the integrated Intel GMA HD 4000. 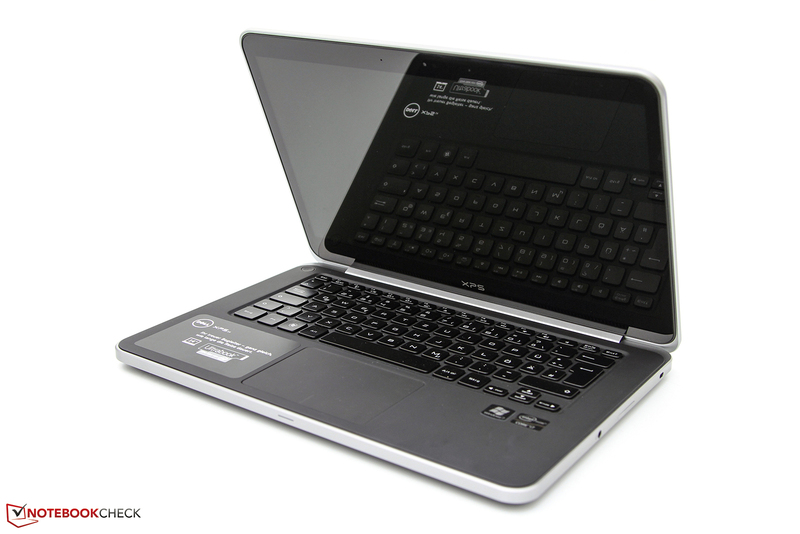 In the case of the Dell ultrabooks we have the Nvidia Optimus automatic graphics card switching. Depending on the load this technology automatically switches between the two GPUs. 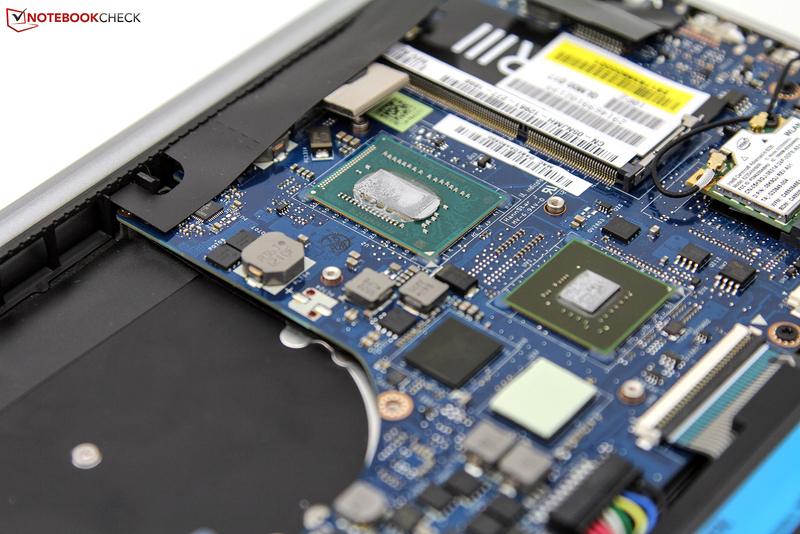 During office use with the CPU graphics card active, the system uses between 7.7 W and 11.3 W. Thus the ultrabook ranks among comparable, but smaller 13.3-inch devices. Under load the Nvidia GeForce GT 630M is activated and the power consumption rises to a maximum of 46.9 W. In comparison: The Dell XPS 13 with older hardware, including integrated graphics, uses only 32.8 W. The current Dell XPS 15 with quad-core CPU, stronger graphics and bigger screen uses considerably more power at 79.6 W. Overall there is no unusual power consumption, which is in between the other XPS units. 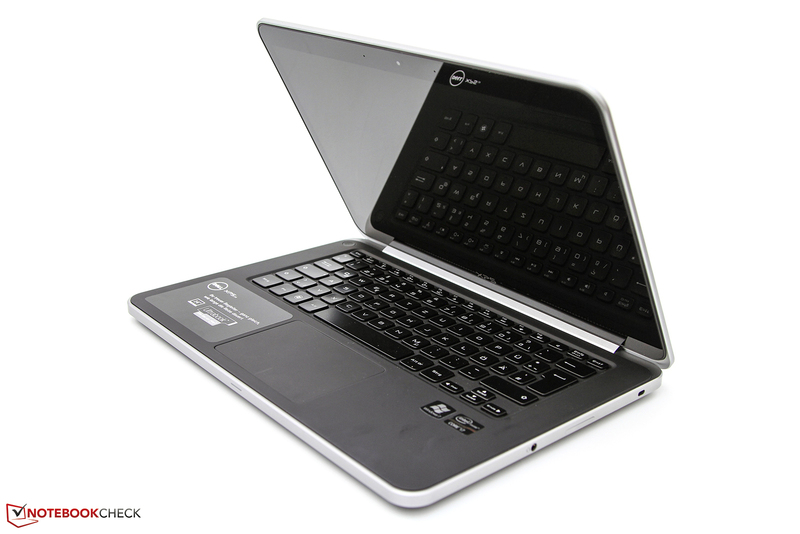 For mobile use, Dell has equipped the ultrabook with a lithium polymer battery with a capacity of 65Wh. On the internet site Dell promises a runtime of eleven and a half hours, which must be proven in a practical test. 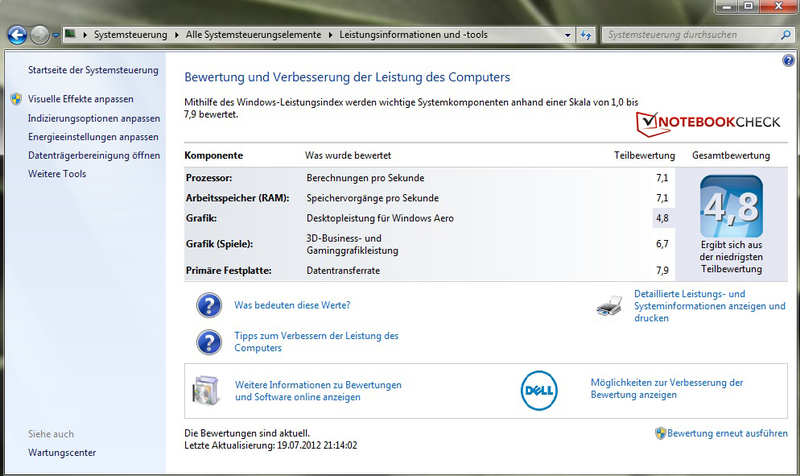 For benchmarking we use the well-known tool Battery Eater under Windows and its different profiles. The classic test loads the system with rendering graphics. In addition this test is run with the Nvidia GeForce GT 630M active, maximum keyboard lighting and screen brightness. After about two hours the test reaches the maximum and the 65W power supply must be reconnected. The continuous load of the classic test represents a higher than usual usage, whereas the "browsing over the Wi-Fi“ is a realistic scenario. In this test different websites are refreshed through a script every 40 seconds. The screen brightness is set at 150 cd/m² so that the measurements are comparable. In the test the acceptable 6 hours and 12 minutes were reached. Back to Dell's promise. The Reader’s test by Battery Eater simulates the reading of an e-book with minimal brightness, wireless modules turned off and the processor graphics active. 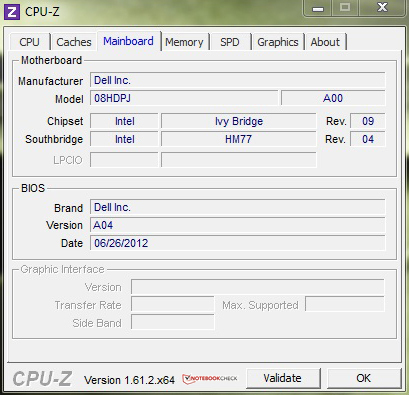 With these settings the XPS 14 exceeds the manufacturer's claims and reaches the convincing 12 hours and 32 minutes. In everyday use the battery runtime is anywhere between 4 and 8 hours, depending on the load of the system. The Dell XPS 14 expands the company's ultrabook portfolio. Nothing more can be desired from the case, the choice of materials and the workmanship. Also we liked the increased number of interfaces, although a third USB 3.0 port on the right side would have completed the picture. The bonus point of the simple maintenance of the components is small compared to the accessories and the warranty duration of only 12 months. The input devices farther the good image of the housing and the same keyboard can be found in the XPS 15. 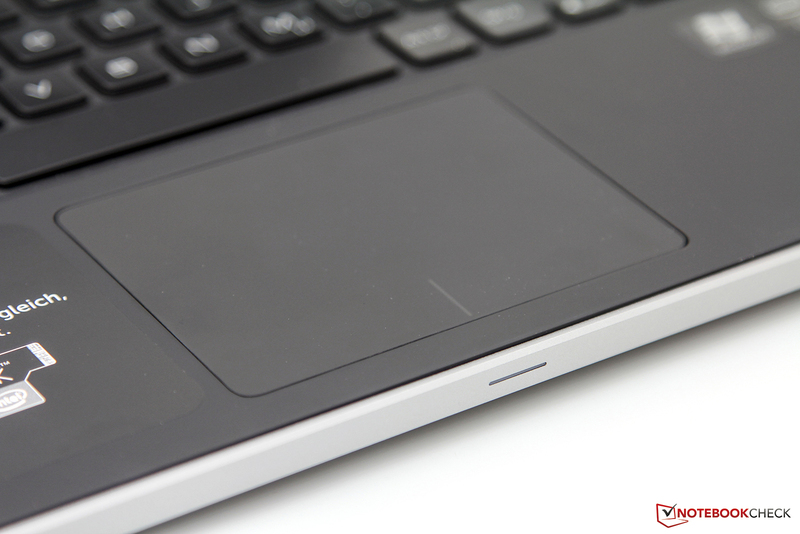 A remnant is the eject icon on the F7 button, which of course makes no sense in the XPS 14. 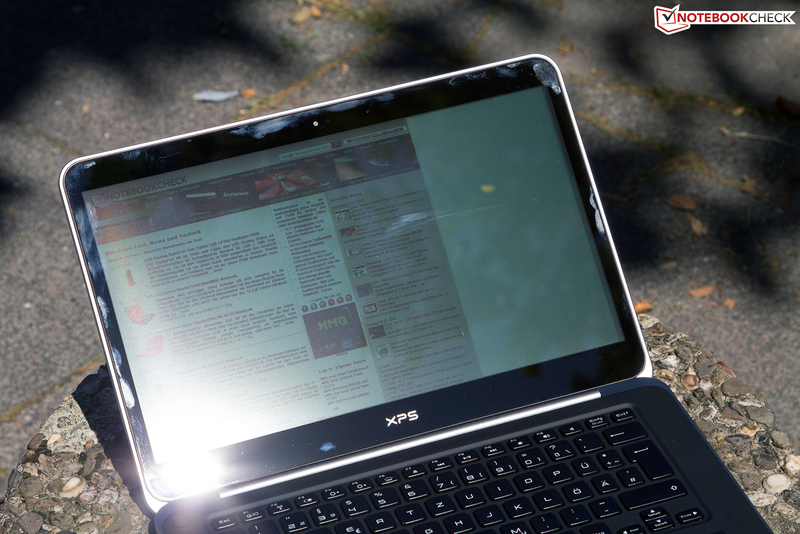 As one of the first ultrabooks on the market, the XPS 14 offers a bigger screen with a resolution of 1600x900 pixels. Apart from the maximum brightness, the rest of the results are less than convincing. With respect to the high entry-level price of over 1000 Euro (~$1230) we were expecting an IPS panel or at least a better quality TN one. The intent of the Corning Gorilla Glass helps the looks and the durability, but hurts the outdoor visibility (distracting reflections). The combination of the Intel Core i7-3517U Ivy Bridge processor and the dedicated Nvidia GeForce GT 630M is a good choice, as the balance between performance and efficiency is mastered. This is further confirmed by the good power consumption levels and battery run times. The stereo speakers surprised us. One does not expect much from a device with a total power of 4W. The XPS 14 shines with balanced sound and good loudness. 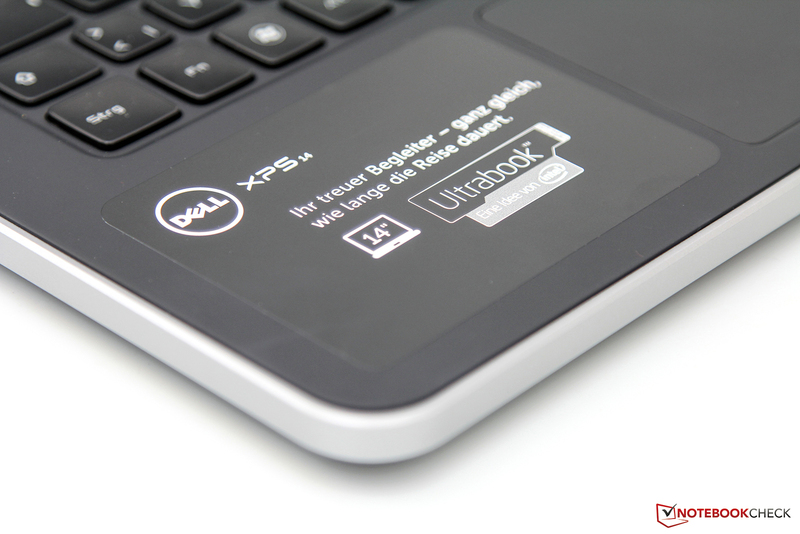 Some manufacturers, which make loud statements and boast using stickers on the devices' housing, can learn from Dell. A final point of criticism is the heat development under load. With temperatures of over 50oC it is sometimes quite uncomfortably warm. All in all a premium ultrabook with strong points. The screen hinders among other things the overall rating, which is currently at 83%. A sheet of Corning Gorilla Glass in front of the display. In direct sunlight it gets a bit critical. The bottom side has a pleasant silicon coating. Two tools are needed to open the chassis. Under the cover: different stickers and two screws. The inside is then fully accessible without any obstacles. 8 GB DDR3 system memory are on one module. The top model offers a 512 GB solid state drive (SSD). The cooling system consists of a fan and a heat sink made of copper. Under them are the CPU (top) and the Nvidia GPU (below). 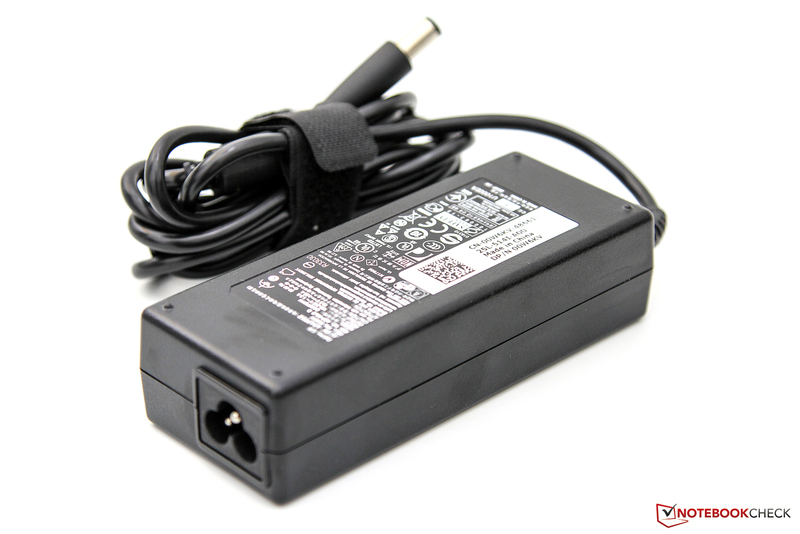 The supplied 65W power supply takes care of the energy. lgith, dark and off. The difference is hard to spot. 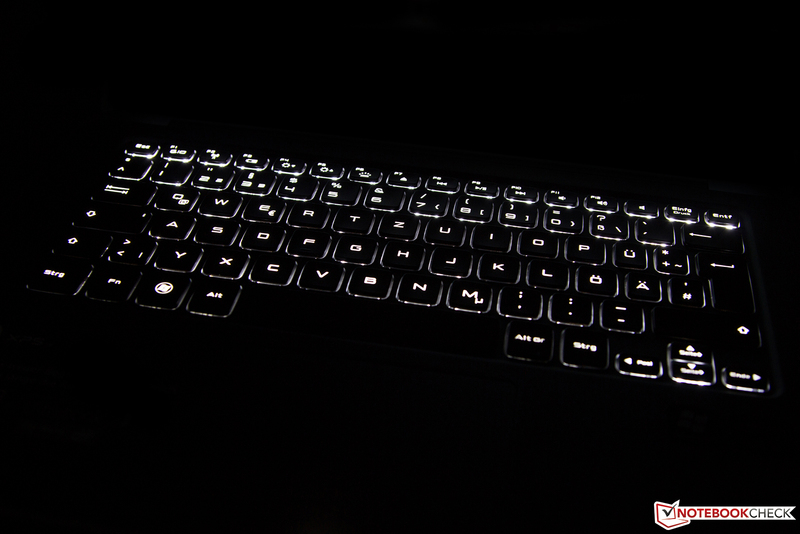 Chiclet keyboard with backllighting and a large touchpad. ...one of the first 14-inch ultrabooks on the market. The chassis is made of a single piece of aluminium (Unibody). The workmanship and feel can be seen. Visually the device reminds of the MacBook Pro series. Almost no difference in the details. The combination of black and silver is beautiful and simple. The interfaces on the left side of the ultrabook. ...a SD card reader, which can be opened only using fingernails. 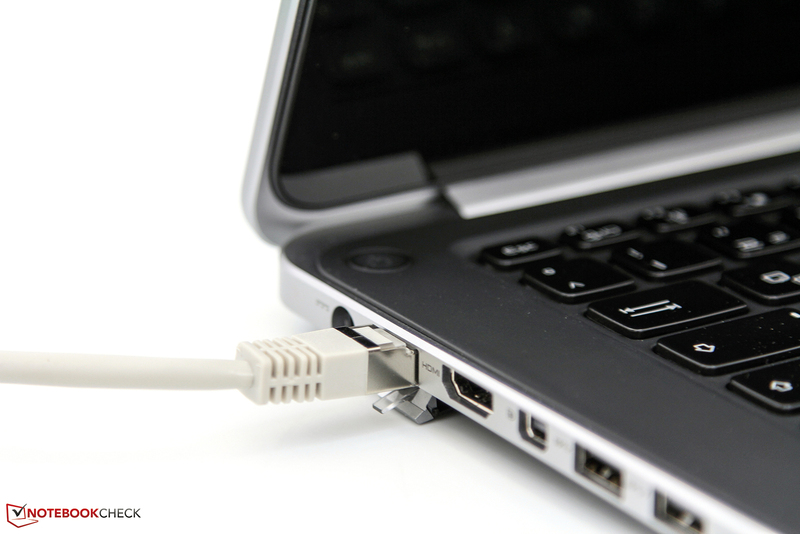 Advantage: A separate RJ-45 network port. The input devices leave a good impression in the review. The workmanship and feel of the case as well as the balance between performance and efficiency. A better cooling system to cope with the heat of the hardware. Furthermore a high-quality matte display. The integrated loudspeakers. With a combined power of just two watts a balanced sound is delivered. Different ultrabooks with the newest generation of energy saving Intel processors. These include the Dell XPS 13 from the same manufacturer, the Asus UX32VD with dedicated Nvidia GeForce GT 620M, the Lenovo IdeaPad U310 and respectively the IdeaPad U410 and also the Toshiba Satellite Z930 with matte display and RJ-45 port. Ultrabooks with a 14-inch display are still rare.